Michael Bernick is co-director of the National Transit Access Center at the Institute of Urban and Regional Development, University of California, Berkeley, CA 94720-1870. He is a former elected member of BART’s Board of Directors. The Bay Area Rapid Transit system (BART) helped pioneer the development of metropolitan rail transit around the country. But did it accomplish all original goals? The initial 1956 plan primarily aimed to save old city centers and reorganize sprawling suburbs by inducing subcenters there. Spaced about 2.5 miles apart, station stops were to become points of high accessibility that would attract high-density residences, retail shops, and office employers. 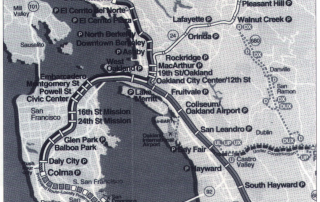 By reshaping the land market through transit-induced access, BART's planners sought to reshape the metropolis and to eliminate traffic congestion.